The National Fire Protection Association (NFPA) sets industry codes and standards for the safe storage, handling, transportation and use of liquefied petroleum gas (LPG) gas. The association regularly publishes its benchmarks and updates in its NFPA Pamphlet 58 (NFPA 58) handbook, available via the NFPA website. 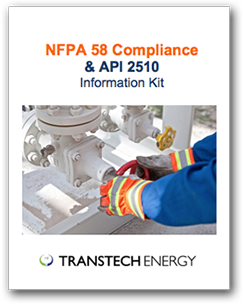 By following NFPA 58 codes, LPG producers, distributors and users can ensure the safety of their tanks and installations by mitigating associated risks including the prevention of tank and equipment failures, tampering and leaks, as well as potential fires and explosions. TransTech Energy is an authority on code compliance, with more than five decades of experience helping our customers achieve safe, reliable operations. As a voting member of the NPGA Technical and Standards Committee, TransTech Energy contributes to NFPA code amendments including interpretation and technical updates to help ensure current code reflects the changing needs of the industry. If your facility is in need of compliance upgrades, or if you aren’t sure if your current operations are up-to-date, we can help. As the nationwide partner of many national propane marketers, as well as some the country's largest manufacturers, we have safely completed NFPA 58 compliance inspections and upgrades for thousands of tanks. We work hard to minimize disruptions to your day-to-day operations, and we have the people, equipment and know-how to ensure work is done safely and on schedule. Call us today at 1-888-206-4563 to learn more.